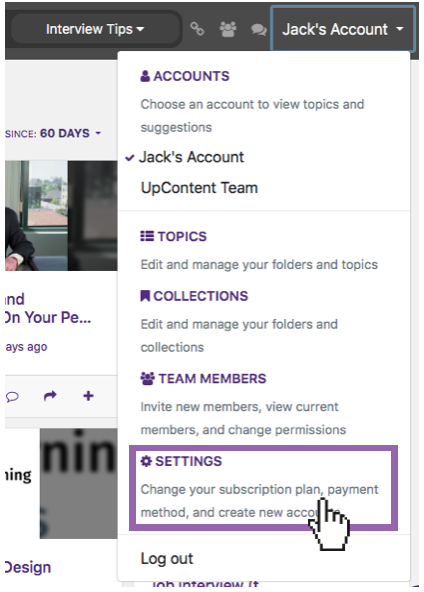 Keeping Team and Personal accounts separate is a good way to manage your topics and settings. Learn how to create a new account here. To create a new account, begin by navigating to the settings screen in your current account. Once there, click on the "Create New Account" button at the bottom left of the screen. NOTE: In order to create a second account, you will need to have a credit card on file with us. Each account has it's own payment method and plan attached. After naming your account, you will be prompted to choose a pricing plan to complete the process.